MEXICO – Mexico Middle School students and staff members rallied together to provide Thanksgiving meals to 12 local families. Student Council members proudly show off the food items collected for Thanksgiving meals for local families. The effort was a school-wide project. Pictured, from left, are Student Council representatives: Liam Killian, Kaylee Greenway, Aaliyah Pape, Ayden Jensen, Mackenzie Barlow, Morgan Eastman, Lauren Salisbury and Alecsis Buda. Sponsored by the school’s Student Council, the annual Thanksgiving Boxes project provided all items for a traditional holiday feast: a turkey, milk, stuffing, gravy, rolls, butter, cranberry sauce, vegetables, potatoes, a frozen pie, whipped cream, a baking tin/bags and cooking directions. Student Council advisors Lisa Brooks and Kim Julian said MMS staff members provided monetary donations for the food. 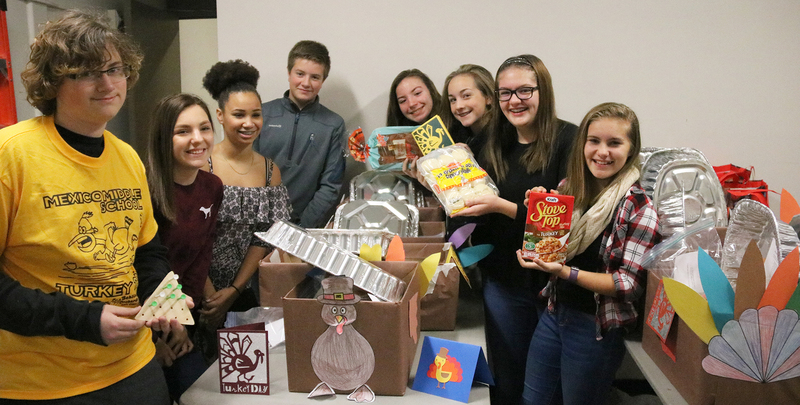 Participants of the MMS after-school program created the Turkey-themed boxes, while the occupational education class made Thanksgiving cards and the technology class made peg game boards so families could have a little fun together. The Student Council provided 10 boxes full of goodies and the Saddle Pals 4-H Club donated two bags full of Thanksgiving meal goodies.